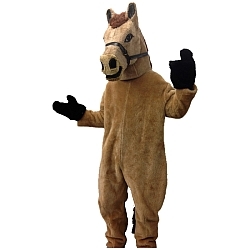 Rental Costume includes: head, bodysuit, 2 mitts, and 2 footcovers. Available in one man or two man version. Please specify which one you would like when ordering. Suit fits standard adult up to 6'2" tall and 220 lbs. Add tummy padding for an additional charge of $10.